We will perform important maintenance works to improve the ASPSMS system on Tuesday, April 12th 2016 between 04:00 - 06:00 CET. This leads to a service interruption for a maximum of 60 minutes. All interfaces (APIs) can not be reached during the service interruption. Scheduled SMS planned to be sent in this period, are sent afterwards. Hint: If you are affected, we recommend that you post terminated SMS into the ASPSMS system beforehand. ASPSMS is now available on NuGet. On the following URL you can download a complete C# Visual Studio 2013 sample website for sending SMS. No separate web server is required, everything runs locally without any changes. Source: Stefan Schweihofer from Munich [CC0 1.0] via pixabay. place an order right now. 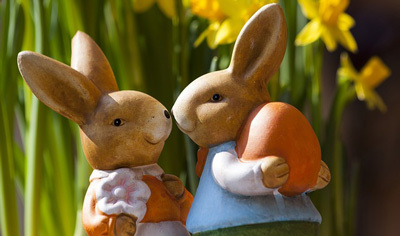 We wish you happy and sunny Easter Holidays! Take advantage of our generous volume discounts by purchasing annual ASPSMS Credits volumes at once. What are ASPSMS Credits and how do I buy some? For sending an SMS, you need so-called ASPSMS credits,which are purchased in advance. The ASPSMS credits donot expire. Up to an amount of CHF 800.00 you can pay by bank transfer, postal card, Mastercard, Visa, Diners Club, American Express or Paypal. From a price of CHF 800.00 on, you can conveniently pay by bank transfer. If you want to buy ASPSMS credits for a different amount, we are happy to send you a VAT-ready invoice as PDF document.Please contact our support to do so. Please mention your ASPSMS account's "Client-ID: 0" and "aspsms.com"in the payment description. With this feature you can let yourself be informed bySMS and/or e-mail if your credit balance reaches orgoes below a certain level.Enter as many recipients, warning levels and warningmessages as you need.